What a life! Hanging out and taking notes for Santa on Mason's good and naughty behavior. Mason was thrilled to see he made it to our recently decorated tree! Here is a really cute activity that you can do with the kids in preparation for the holidays. Make a sparkly pincone to put in baskets or displays for around the holidays. Have your toddler begin decorating the pinecones by applaying the glue over the ridges and ends of the pinecone. Then have him drop the pinecone into the glitter, close the bag, and shake it. Make several of these and display them around the house. Looks like Mason isn't the only one who gets a Time Out! I wonder what he did?!?!?!?! I think I have fallen in love with the Hearts For Heart Girl line of dolls! Not only are they sweet, wholesome, and appropriate for girls of all ages, each Hearts For Hearts Girls doll represents a real girl from a real place around the world. Each has her own story to tell, with ideas about how to make life better for her family, community, country, and the world around her. Also, included with the doll is a booklet that gives information about the dolls' family and culture. There are six beatuiful girls to choose from. There is Dell from the USA , Consuelo from Mexico , Nahji from India , Tipi from Laos, Lilian from Belarus , and Rahel from Ethiopia . What makes this collection of dolls even better than a personal story? When you buy a doll, Hearts For Hearts Girls donates part of the purchase price through their charitable partner, World Vision, to programs that support girls in that country. Whether it’s malaria nets in Africa, schoolbooks in Asia, or food supplies in the US, these programs help girls to thrive and succeed. Hearts For Hearts dolls are beautifully packaged in a box that has a door you can open and see the doll and all of her accessories. The details on the doll and her clothes are realistic and authentic. The dolls have very pretty faces and beautifully detailed clothes and accessories to match. The Girls' hair is rooted in the doll, nice and thick. I imagine any little girl will love spending hours brushing and styling her hair. Another nice feature of the Heart For Hearts dolls is that the arms, legs, and head are movable and allow for posing. Each Hearts For Hearts doll also comes with a special product code. Once you enter that code and create a user name on the hearts4heartsgirls.com website, you can enjoy all of the online content and activities—for free! If you don’t own a doll or don’t want to register, you can still visit and enjoy parts of our website—but you will be missing out on some of the fun. Overall, this is a high quality product that gives back. It is educational in that it teaches children about other cultures and how we can help others. Heart For Hearts doll retail for about $24.99 and are recommended for ages 6 to 9 years old. You can also buy additional accessories and outfits for the Hearts For Hearts Girls. You can also read each doll's diary, play fun games, a myHeart page, activities, and view inspiring stories of real girls on the Hearts For Hearts Girls colorful, kid-safe website: www.hearts4heartsgirls.com. Do you loves these dolls as much as I do? DO you want to wind one of your own? Fill out the form below to enter to win. The Giveaway begins on 12/7/11 at 8:00pm and will end on 12/14/11 at 8:00pm. Congratulations to Nancy M, winner of Hearts For Hearts Girls Giveaway. The winner will have 48 hours to respond to my email, or another winner will be chosen. Playmate Toys provided me with the items above in order to facilitate this review and giveaway. All opinions are 100% mine. Today, Tuesday, December 6, 2011, is St. Nicholas Day. Although St. Nicholas is mainly celebrated by Catholic and Orthodox Christians, he is also honored by various Anglican and Lutheran churches. Saint Nicholas is the patron saint of sailors, merchants, archers, thieves, children, and students. What and who is St. Nicholas? He is known as St. Nicholas, Sinterklaas and Santa Claus among many other names. St. Nicholas Day celebrates the life of Saint Nicholas of Myra, a fourth-century bishop best known today as the real-life model for Santa Claus. The true story of Santa Claus begins with Nicholas, who was born during the third century in the village of Patara. Obeying Jesus' words to "sell what you own and give the money to the poor," Nicholas used his whole inheritance to assist the needy, the sick, and the suffering. He dedicated his life to serving God and was made Bishop of Myra while still a young man. Bishop Nicholas became known throughout the land for his generosity to the those in need, his love for children, and his concern for sailors and ships. He died December 6, AD 343 in Myra. The anniversary of his death became a day of celebration, St. Nicholas Day, December 6th. How is St. Nicholas Day celebrated? As St. Nicholas was known for his love of children, various children festivals are held in his honor. Moreover, children who have been behaving well are given small gifts and candies by people who pretend to be St. Nicholas. This is in keeping with a tradition that was purportedly started by the saint himself. Legend also has it that children put carrots, turnips, or hay in their shoes for St. Nicholas' horse or donkey and St. Nicholas would replace them with treats. So shoes filled with treats for children or feed for horses and donkeys are also symbols of St. Nicholas. As a child I would put my shoes outside of my bedroom door with the hopes that I would receive a small treat in the morning. And, as promised, I would receive a large candy cane stick. This is a tradition I will be starting with Mason this year. Even though he does not understand who St. Nick is yet, it is a tradition I hope to carry on and that it will be something he will remember and maybe pass along to his children some day. Here is the perfect present for the little girl or boy in your life who might also be the resident artist of the house. 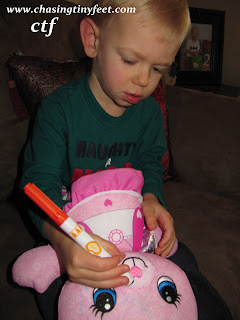 The Fisher Price Doodle Bear is the perfect combination of stuffed animal and art activity. Instead of drawing on walls or sofas, your budding artist can draw, doodle, trace or stamp whatever their heart desires on the bear. The best part about this toy is that when your child is done creating their latest masterpiece, you can throw it in the washer to start all over again. I love that the Doodle Bear helps to promote creativity while using your child's imagination. 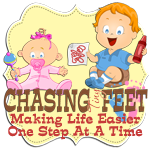 Your child will have an educational and artistic experience that can provide for hours of fun. Mason couldn't wait to draw all over his bear. 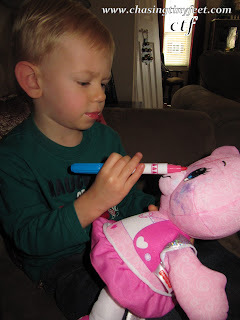 He had so much fin experimenting with each color and made sure he used all of them, even the stampers! When your child is done drawing, all you have to do us put your Doodle Bear in a pillow case and throw it in the washer. It can even be tumbled dry when the wash cycle is over. 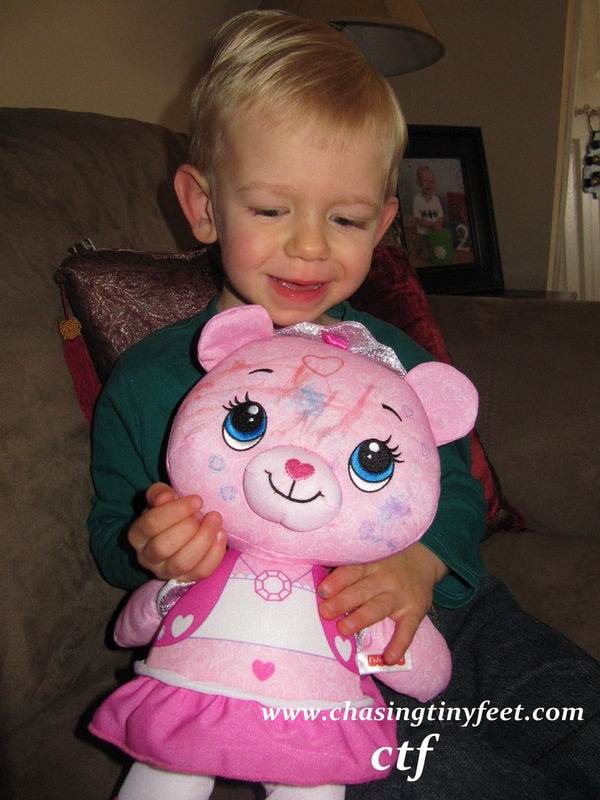 The Fisher Price Doodle Bear is available in three colors: Pink , Purple , and Blue , making it perfect for a boy or a girl. The bear comes with two dual-tipped washable markers that have a drawing tip at one end and a stamper at the other for you to stamp on special designs. A stencil with three shapes is also included so you can trace hearts, flowers or tiaras all over your bear. It retails for about $22.00 and is recommended for ages 3 and up. And, if you run out of markers, you can get a refills of Fisher-Price Doodle Bear Marker Pack, Doodle Bear Washable Fruit Scented Marker Pack or the Fisher-Price Doodle Bear Stamper, all for a reasonable price too! To find out more about the Doodle Bear or other great Fisher Price products, go to Fisher Price online. Fisher Price provided me with the item above in order to facilitate this review. All opinions are 100% mine.